The children loved to gather around him. HERE WAS AT Capernaum an officer of the Roman army, a man who had under him a company of a hundred men. They called him "a centurion," a word which means "commanding a hundred"; but we should call him "a captain." This man was not a Jew, but was what the Jews called "a Gentile," "a foreigner"; a name which the Jews gave to all people outside their own race. All the world except the Jews themselves were Gentiles. This Roman centurion was a good man, and he loved the Jews, because through them he had heard of God, and had learned how to worship God. Out of his love for the Jews, he had built for them with his own money a synagogue, which may have been the very synagogue in which Jesus taught on the Sabbath days. The centurion had a young servant, a boy whom he loved greatly; and this boy was very sick with a palsy, and near to death. The centurion had heard that Jesus could cure those who were sick; and he asked the chief men of the synagogue, who were called its "elders," to go to Jesus and ask him to come and cure his young servant. "He is a worthy man, and it is fitting that you should help him, for, though a Gentile, he loves our people, and he has built for us our synagogue." Then Jesus said, "I will go and heal him." "Lord, do not take the trouble to come to my house; for I am not worthy that one so high as you are should come under my roof; and I did not think that I was worthy to go and speak to you. But speak only a word where you are, and my servant shall be made well. For I also am a man under rule, and I have soldiers under me; and I say to one 'Go,' and he goes; and to another, 'Come,' and he comes; and to my servant, 'Do this,' and he does it. You, too, have power to speak and to be obeyed. Speak the word, and my servant shall be cured." "In truth I say to you, I have not found such faith as this in all Israel!" "Go and say to this man, 'As you have believed in me, so shall it be done to you.'" Then those who had been sent, went again to the centurion's house, and found that in that very hour his servant had been made perfectly well. On the day after this, Jesus with his disciples and many people went out from Capernaum, and turned southward, and came to a village called Nain. Just as Jesus and his disciples came near to the gate of the city, they were met by a company who were carrying out a dead man to be buried. He was a young man, and the only son of his mother, and she was a widow. When the Lord Jesus saw the mother in her grief, he pitied her, and said, "Do not weep." "Young man, I say to you, Rise up!" And in a moment the young man sat up and began to speak. Jesus gave him to his mother, who now saw that her son who had been dead, was alive again. And Jesus went through all that part of Galilee, working miracles and preaching and teaching in all the villages, telling the people everywhere the good news of the kingdom of God. 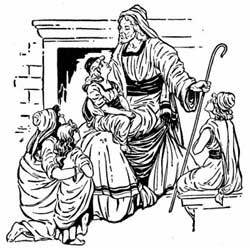 The children loved to gather around him, and when his disciples would have driven them away he said, "Suffer the little children to come unto me and forbid them not, for of such is the kingdom of heaven." One Sabbath day, as Jesus and his disciples were walking in Jerusalem, they met a blind man begging. This man in all his life had never seen; for he had been born blind. The disciples said to Jesus as they were passing him: "Master, whose fault was it that this man was born blind? Was it because he has sinned, or did his parents sin?" "This man was born blind, not because of his parents' sin, nor because of his own, but so that God might show his power in him. We must do God's work while it is day, for the night is coming when no man can work. As long as I am in the world, I am the light of the world." When Jesus had said this, he spat on the ground, and mixed up the spittle with earth, making a little lump of clay. This clay Jesus spread on the eyes of the blind man; and then he said to him: "Go wash in the pool of Siloam." The pool of Siloam was a large cistern, or, reservoir, on the southeast of Jerusalem, outside the wall, where the valley of Gihon and the valley of Kedron come together. To go to this pool, the blind man, with two great blotches of mud on his face, must walk through the streets of the city, out of the gate, and into the valley. He went, and felt his way down the steps into the pool of Siloam. There he washed, and then at once his life-long blindness passed away, and he could see. When the man came back to the part of the city where he lived, his neighbors could scarcely believe that he was the same man. They said: "Is not this the man who used to sit on the street begging?" "This must be the same man," said some; but others said: "No, it is some one who looks like him." But the man said, "I am the very same man who was blind!" "Why, how did this come to pass?" they asked. "How were your eyes opened?" "The man, named Jesus," he answered, "mixed clay, and put it on my eyes, and said to me, 'Go to the pool of Siloam and wash,' and I went and washed, and then I could see." "A man put clay on my eyes, and I washed, and my sight came to me." "The man who did this is not a man of God, because he does not keep the Sabbath. He makes clay, and puts it on men's eyes, working on the Sabbath day. He is a sinner!" Others said, "How can a man who is a sinner do such wonderful works?" And thus the people were divided in what they thought of Jesus. They asked the man who had been blind: "What do you think of this man who has opened your eyes?" "He is a prophet of God," said the man. "Is this your son, who you say was born blind? How is it that he can now see?" "We know that this is our son, and we know that he was born blind. But how he was made to see, we do not know; or who has opened his eyes, we do not know. He is of age; ask him, and let him speak for himself." "Give God the praise for your sight. We know that this man who made clay on the Sabbath day is a sinner." "Whether that man is a sinner, or not, I do not know," answered the man; "but one thing I do know, that once I was blind, and now I see. We know that God does not hear sinners; but God hears only those who worship him, and do his will. Never before has any one opened the eyes of a man born blind. If this man were not from God, he could not do such works as these!" The rulers of the Jews, these Pharisees, then said to the man: "You were born in sin, and do you try to teach us?" "Do you believe on the Son of God?" "And who is he, Lord, that I may believe on him?" "You have seen him," said Jesus, "and it is he who now talks with you!" And he fell down before Jesus, and worshipped him.